Yike… This is a tough question. But if we try to answer to this question, we will be able to understand and determine about usefulness of SEO in Myanmar. 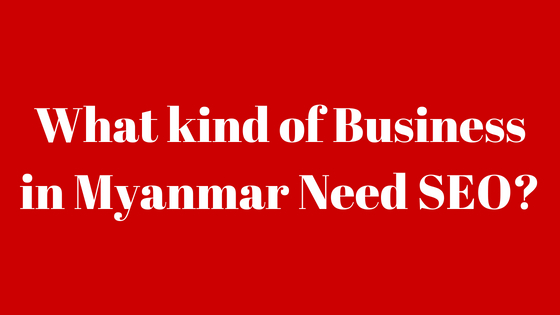 This post will let you know what kind of business in Myanmar need SEO, then you can consider yourself about your business. If your business in Myanmar is big company or small one, you may need to think and revisit that will you need SEO optimized website for your businesses. Before answering to the above question, we should start to think about “Do business in Myanmar need a website?”. After the emerging popularity of social media, most of the businesses in Myanmar built their profile and place on social media. They invested a lot (time, men power, money) tor grow their business on social media. And most of them are happy with the results they gained from social media. But one of the pitfall of social media is you need to extremely depend on Social media ads to promote your business page and post to reach audiences and to get sales funnel. If you stopped using social media ads, your sale will be decreased unless you successfully built a brand for your business.But most businesses missed to build a brand on social media. So most of the businesses largely depend on social media ads and it drained a lot of their marketing budget. It will also depend on the type of business. If your business is focusing to the person who are only active on social media, you may not probably need a website. But if your business need to be engaged with the audience who regularly use search engine and website, you must have a SEO optimized website. (Here I used the term SEO optimized website as owing website alone cannot get traffic). So to answer to the question “Do business in Myanmar need a website?”, what I would like to say is it will depend on your business niche. What kind of business in Myanmar need SEO optimized website? Having website for your business help to build trust among your clients on your business. Having SEO optimized website is more important than owing just a website. Above businesses were usually searched on search engines by potential users. So that if you have a website with optimized keywords related with above sectors, you will be visualized by search engine to the users. But getting your place on first page of google will not be an easy task. It is not a week or a month tasks. It needs time, knowledge, effort, patient and investment to get the desired result. But after you get it, you will get flow of regular customers from web organic search passively. To summarize, considering deciding to use SEO totally falls under your business types and your marketing strategy. But what I would like to suggest you is that if your businesses are included in above mentioned business category, it is worth to use SEO which will help you in long term. SEO will help you to get customers flow passively from search engine. SEO will save your social media Ads budget in long term. You will get more trusty worthy from customers as you have website for your business. You can go beyond Local audience and expand your business without any boundary. If you want to know more about SEO and digital marketing, you can reach out to me by sending email at hi@aunghein.com.